If you are looking to get your cleaning off to a great start they are many tried and tested methods, but for me it is little and often and here I am going to share my easy cleaning techniques that will speed up the cleaning process giving you more free time to enjoy being with your family and friends. It is important that you realise that the more you clean the quicker the job takes and this reduces the overall time that you can spend cleaning. For me it is important that I try to keep up with the dusting, it is something I hate to see, but I hate doing the dusting too. So how I overcome this is that I don’t spend very long at the task but dust frequently. The feather duster is my friend and I can quickly go over the surfaces that attract the dust every other day or so. This keeps the dust from settling on my ornaments or on my glass TV table. Then once a week I get the polish out and do a top to bottom marathon dusting session. But I have found that I like the dusting mitt in preference to the traditional dusters. I find that if I use a normal duster I can get side tracked very easily and I lose the duster and my dusting task takes twice as long. For me the bathroom cleaning is an ongoing process, I don’t have a day to clean the bathroom, I just clean it every-day. This might sound like a lot of work when in fact it is the easiest and the least work possible. When I use the bathroom over the course of the day, I clean it. I wipe the sink down once a day along with the bath / shower and the toilet gets a wipe down and bleached at the end of the day. 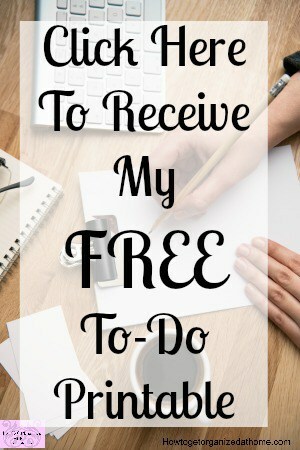 For me this is the best way, I don’t have to plan a massive cleaning session each week and worry about the days in between. I will then do a deep clean once every couple of weeks. I hoover / sweep the downstairs floors every day. This is because I have dogs and they drop hair everywhere. But it is not a detailed hoover it is just to get the basic done, the middle of the rooms with the hoover and a quick sweep of the tiled floors. This gets rid of the basic dog hair, then once a week I will do a more detailed hoover of the whole house. This stops the dog hair building up over the week, but the upstairs of my home is only hovered once a week. The thing I hate most is mopping the floors, I invested in a steamer and I am not thrilled with the results of that. So, I steam the floors once a week and in-between this I just do spot checks. This I use the floor cleaner and kitchen paper, this is for the entrance mostly when people and dogs walk in with wet shoes and feet. 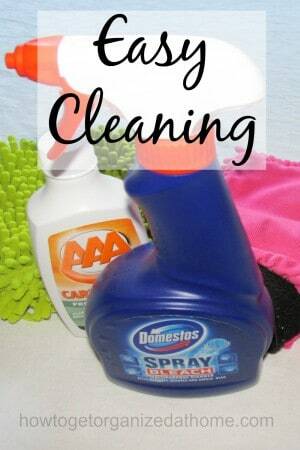 I find these three techniques tackle the home and they are my easy cleaning tips. They are fast and they allow you to continue on with your life without feeling trapped to the cleaning as well.